The Ironman 1921 treadmill is an attractive pale grey contemporary design with superior deck cushioning technology to ease stress on the joints, and easy access handlebar mounted speed and incline controls. 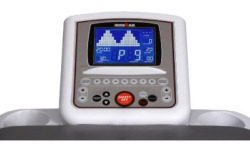 The console on the Ironman 1921 treadmill features a large 5¾" x 4½" blue backlit LCD window with readouts for program profile, time, speed, pace, distance, calories, incline, pulse, and laps. The incline range is 0 to 12% in 0.5% increments and comes with remote speed and incline controls on the handlebars. Wt / Dimensions: 205 lbs / 76.5" x 33.6" x 59.4"
With a roomy running surface of 20" x 60", a user weight capacity of 300 pounds, and a 5-year parts warranty, the Ironman 1921 treadmill is built for rugged workouts. It has superior deck absorption technology with multiple points of cushioning, a 3 hp continuous duty DC motor, a 3/4" composite fiberboard deck, 2.36" rollers with sealed bearings, 14-gauge tube frame, and front transportation wheels. The good news is that Ironman was a part of Keys Fitness (now bankrupt) but is now owned and distributed by Star Trac, an elite manufacturer of commercial fitness equipment. That’s important to know because, other than some cosmetic differences, the Ironman treadmills are copies of their new Star Trac cousins, the ST Fitness models which came out in 2009. For example, this Ironman treadmill is similar to the ST Fitness 4920, which is sold through specialty retailers for $1,795. The Ironman 1921, however, has an expanded tread belt, and it sells for $1,299 with free shipping at amazon.com. 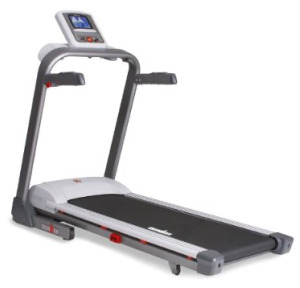 This is a quality treadmill without the frills of music ports, speakers, fans, and the types of things that add to the price but might not be something you want or will use. 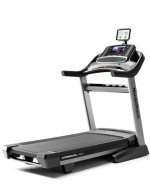 The Ironman 1921 scores above average in treadmill reviews for its power, low noise, cushioning, reliability, stability, design, and warranty. Taken together, this impressive result make for a Good Buy when the Ironman 1921 treadmill sells for as low as $1,299. The only drawback, however, is that lack of entertainment “goodies” that come standard with other treadmills such as Sole, Spirit, and new models such as the Livestrong LS12.9T treadmill.